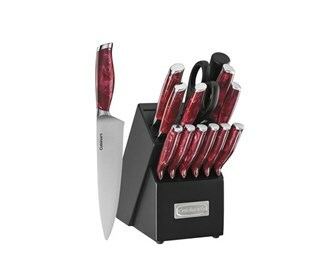 The Cuisinart C77MB-15PR is a 15-piece block set with a stylish red marble look. 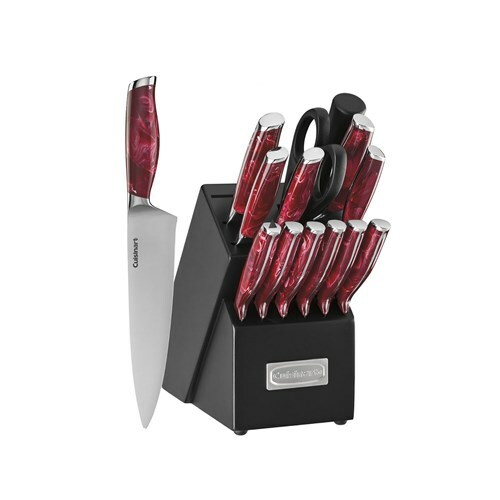 The ergonomic design makes each knife easy to handle. The stainless steel blade provides razor sharp cutting-edge for professional results. The non-stick coating makes slicing easier and avoids contamination during food preparation. The Cuisinart C77MB-15PR has many exciting features for users of all types. See the Cuisinart C77MB-15PR gallery images above for more product views. The Cuisinart C77MB-15PR is sold as a Brand New Unopened Item.